But there is one more, much simpler way of flat band formation. This was shown by a group at the HZB around Prof. Oliver Rader and Dr. Andrei Varykhalov with investigations at BESSY II. The samples were provided by Prof. Thomas Seyller, TU Chemnitz. There they are produced using a process that is also suitable for the production of larger areas and in large quantities: A silicon carbide crystal is heated until silicon atoms evaporate from the surface, leaving first a single-layer of graphene on the surface, and then a second layer of graphene. The two graphene layers are not twisted against each other, but lie exactly on top of each other. Via an exact analysis of the band structure, they identified an area that had previously been overlooked. "The double layer of graphene has been studied before because it is a semiconductor with a band gap," explains Varykhalov. "But on the ARPES instrument at BESSY II, the resolution is high enough to recognize the flat area next to this band gap." 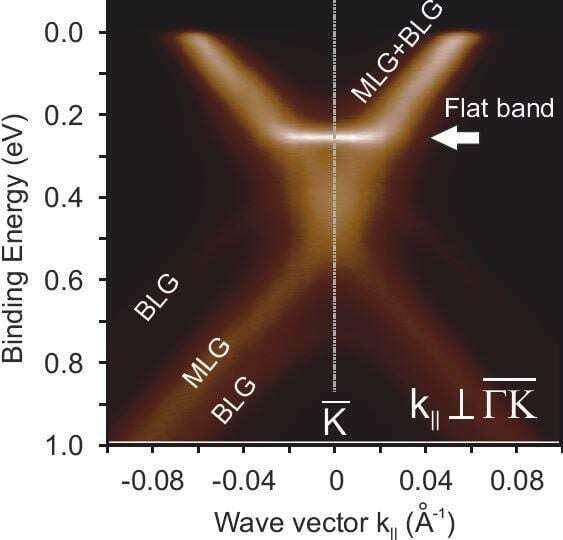 "It is an overseen property of a well-studied system", first author Dr. Dmitry Marchenko points out: "It was previously unknown that there is a flat area in the band structure in such a simple well-known system."